A leaked presentation from the RIAA shows that online file-sharing isn't the biggest source of illegal music acquisition in the U.S. The confidential data reveals that 65% of all music files are "unpaid" but the vast majority of these are obtained through offline swapping. The report further shows that cyberlockers such as Megaupload are only a marginal source of pirated music. In April, one of the RIAA’s key employees informed a group of music industry insiders about the upcoming six-strikes anti-piracy scheme in the U.S. TorrentFreak received a copy of the presentation sheets which include a rather interesting chart on where people get their music files from. The data presented by the RIAA comes from NPD’s Digital Music Study but has never been published in public in its current form. 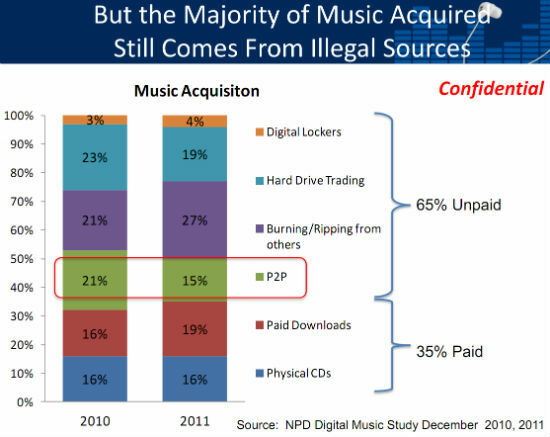 While NPD’s press release mentioned a decline in music acquisition through P2P file-sharing and hard drive trading, these numbers were not placed in a larger context. A strange decision, because the chart below is of critical importance for the debate on music piracy. As it turns out, two thirds of all music acquired in the U.S. is unpaid. However, offline trading is a much bigger source of unpaid music than online piracy. Of all “unpaid” music less than 30 percent comes from P2P file-sharing or cyberlockers. In total, 15 percent of all acquired music (paid + unpaid) comes from P2P file-sharing and just 4 percent from cyberlockers. Offline swapping in the form of hard drive trading and burning/ripping from others is much more prevalent with 19 and 27 percent respectively. This leads to the, for us, surprising conclusion that more than 70% of all unpaid music comes from offline swapping. The chart is marked “confidential” which suggests that the RIAA doesn’t want this data to be out in the open. This is perhaps understandable since the figures don’t really help their crusade against online piracy. The RIAA is lobbying hard for legislation and voluntary agreements to deal with the online piracy problem, an issue that might seem less severe in the chart above. While not insignificant, the fact that less than one in five music acquisitions can be traced back to online file-sharing isn’t really that convincing – especially when one takes into account that only a tiny fraction represent a lost sale. More revealing findings from the RIAA will be published soon. c There are 211 comments. Add yours?